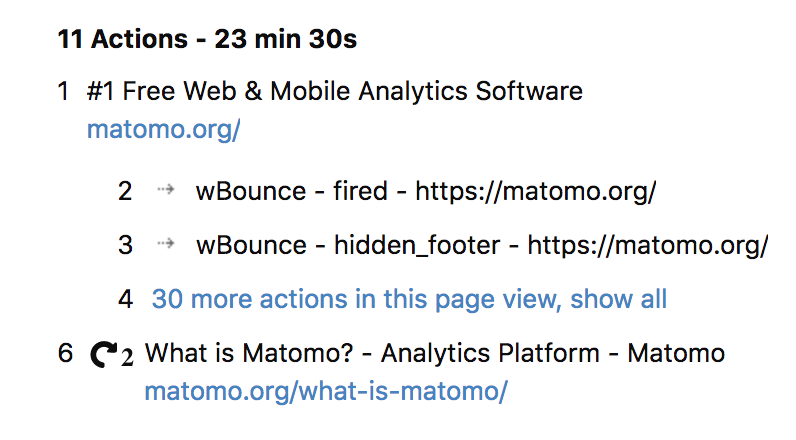 In Matomo 3.0 we introduced a new pageview id so we can identify which events etc were performed within a specific page view. This is especially useful when users have multiple tabs open and events or tracking requests are sent from both pages at the same time. Ideally, we would "group" all events that were done under a specific pageview together. For example, we could intent all events/form tracking requests/content tracking requests/ ... if we can identify it to a particular page view. A page view with all the related actions would then be collapsible so that it is easy to hide all actions that were part of a certain page view. This is especially useful when having many actions within one visit or page view. We could for example auto collapse all actions when there are > 10 actions for one page view. In this case we would show eg the first 3 actions, followed by "show all" actions. We would also need to make this work for our tracking plugins like form analytics. The idpageview should be tracked there already. Unfortunately, I noticed we do not track it yet for media analytics and we would need an update for this (maybe as part of Matomo 4 release). We might still need the possibility to not merge it? Not sure... as sometimes it may still be useful to see the actions one after another how they happened and not grouped by page view. When someone doesn't track page views for example, or for old visits that don't have the page view ID we would just show it in the regular way.